We Were Featured On WZZM 13! Yesterday, we had the incredible experience of being able to meet with Jaleesa Irizarry, a Lakeshore Reporter with WZZM 13. She wanted to interview Electric Bike Place (powered by MACkite) to discuss the recent pass on the new electric bike laws from January 2018 to see how they have effected the sales of electric bikes. Jaleesa reached out because we had recently sent out a press release, which we turned into a blog a few days ago. Going into it, I was a little nervous. I had been on TV only a few times before. Thankfully, Jaleesa was incredibly kind and made the process comfortable. We started in our showroom, featuring our line of 20 - 30 electric bikes to discuss the benefits, the change in the law, and the increase of sales. "We started with three [electric bike] brands, last year we were at five, and now we're at eight," I mentioned. After that brief interview, we went to ride the bikes! Jaleesa had never been on an electric bike before, but that did not stop her from jumping into line with the employees at MACkite. Steve, the owner of MACkite, and myself rode next to Jaleesa to make sure she was comfortable to go on a bike ride to Hofma Park, which is located on a dead end street but offers water way access and a great park for families. All in all, the process probably took about an hour for myself and the MACkite staff to be filmed before Jaleesa spent another hour filming herself to get all of the great angled shots that you can see. We really appreciated having Jaleesa out to ride with us as well as WZZM 13 for featuring the video! 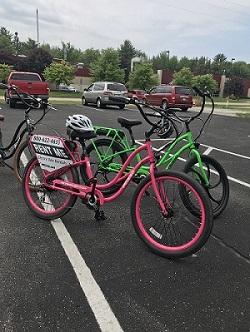 You can watch the WZZM 13 video and learn more about electric bikes, here.